Original Smart View Flip Leather Stand Case for Huawei Mate 20 X Android phablet. The Huawei flip cover case features an intuitively designed Smart View window in the front cover, allowing you to quickly and easily view the time, date, weather and your notifications without the need to open the front cover. 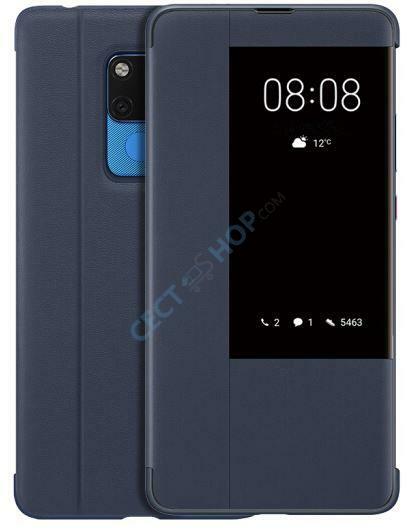 It is designed specifically for Huawei Mate 20 X and offers a perfect fit with all openings and cutouts available for camera, LED flash, microphone or the USB charging port, as well as for the volume rocker and the power button. The case has a secure grip and is easy to clean. The kick stand design makes it easy to adjust for watching movies freely. The flip cover protects your Mate20 X from scratches and other daily influences. The most important part of the phone, the screen, is protected from harm as well. The case is made of premium PC and imported PU that feel like line, clear and bright with a comfortable hand feeling. The window offers a high definition view, shows time, date and answer calls, intelligent and convenient as it should be. Order and buy the Huawei Mate 20 X Smart Window Flip cover now online. The best protection for your Huawei Mate 20 X smartphone. Diese Hülle kam schnell und ordentlich verpackt an. Die Anzeige von Uhr etc ist automatisch beim zuklappen Angezeigt worden. Sie schließt schön, flappt nicht bei jeder Bewegung auf, hätte mir persönlich einen minimal stärkeren Magneten oder sowas gewünscht, ist aber nur Luxus dann.